The Ultimate Adventure. 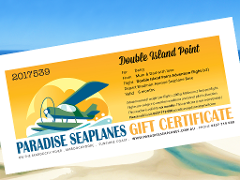 Take off from paradise at the Maroochy River, taxiing in the spray of warm waters, sweep along the Mooloolaba beach, circle over Point Cartwright and return to Maroochydore. 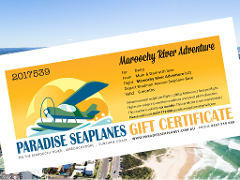 Our most popular flight departs the Maroochy River, soars over the Mooloolaba harbour and follows the beautiful coastline to Caloundra then returns to gently touch down on the crystal clear waters of the Maroochy River. 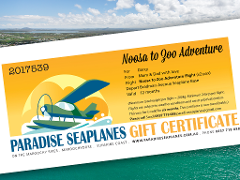 Unforgettable Noosa Adventure. 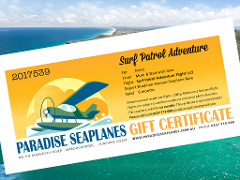 Take off, follow the Maroochy River to the coast, then bank north over Mudjimba Island, follow the beaches past Mt Coolum, over Noosa National Park to Noosa River and return to touch down at Maroochydore. This Big Beach Adventure takes in the entire Sunshine Coast from Noosa to Caloundra! 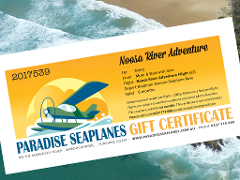 Take off from Maroochy River, then bank slowly north and follow the beaches to Noosa Heads National Park, then south to the tip of Bribie and return! Perfect Nature Coast Experience! Fly north and follow the beaches past Noosa, along the spectacular Great Sandy National Park to Double Island Point, sweep around for a great vantage of Rainbow Beach, return to the beautiful Maroochy. 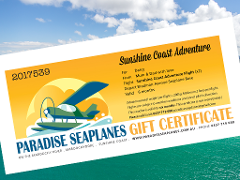 Iconic Sunshine Coast Experience: Coast to Hinterland Adventure - Experience the sensation of floating above our beaches, Noosa and the majestic Glass House Mountains, our beautiful Hinterland in an authentic Wilga Spy Plane.